Sente is a Japanese Go term adopted into English. The root meaning of sente is playing first. A player can have sente. A player can take sente. A move can be sente. A position can be sente for a player. A player has sente if it is their turn. (In particular, when they do not have to answer their opponent's last move.) Thus, a player who has sente can decide where to play next. Just as the base meaning of sente is playing first, a derived meaning is playing first in a local position. Thus, a player may avoid a local reply to the opponent's last move and take sente to play first elsewhere. In this position Black can play in sente, because White has to answer to avoid dying. Not to have sente is to be constrained into a direct answer to your opponent's previous play. This state of affairs is called gote: having gote, taking or accepting gote. The English term most closely connected is therefore the initiative: which changes hands during the game. double gote if neither it nor the opponent’s move is sente. A position is sente for a player if one may expect them to get to play there first. 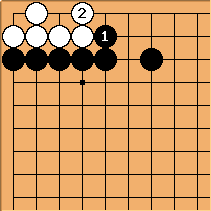 This position is sente for Black because their threat to save two stones is greater than White's gain from preventing that threat. Therefore we expect Black to be able to play first in this position with sente. That may not always be the case, but it is the normal state of affairs. We say that Black has the privilege of playing first in this position. Especially in the endgame, a position may also be described as sente, reverse sente or gote for a player if a move there is that for them. A position may also be called double sente or double gote in the obvious senses. PJTraill: Are these usages perhaps discouraged, deprecated, disparaged or despised? In The Endgame (the book) they certainly apply the terminology to situations, which seems to mean the same as positions. Please someone update the paragraph to reflect observed usage and educated opinion and remove this annotation. As noted above, in the endgame the classification into (one-sided) sente, reverse sente, double sente or gote (i.e. double gote) is much used. In particular, a local sente position often refers to one player having a sente move and the opponent having a gote move. This classification is important to determine the correct priority of plays.